NEW EXECUTIVE MANAGEMENT BOOK ! Published by Contemporary Books, Chicago, Illinois. Book Description: Along with technology and innovation, trust is one of the most powerful forces driving business today. Yet many companies wallow in a culture that is almost devoid of this virtue both inside their walls and with their customers. What many people don't realize, however, is that trust can be created in an organization. Using Built on Trust for managing change in the workplace, companies can develop an enduring culture of earned trust that includes everyone on the payroll and increases opportunities to stimulate growth, productivity, profits, and job satisfaction at virtually no cost. This is one of your best conflict resolution and management tools. Book Background: As a young pediatrician, Dr. Arky Ciancutti observed something that we all know intuitively: when a patient's health care team is actively interested and engaged, every day, the patient often gets better faster. Fascinated with the possible links between "team engagement" and executing better health care, Arky changed specialties to emergency medicine, where teams are critical and where success and failure are visible moment to moment. Arky asked questions like, "What causes working people to become committed, and then uncommitted?" and, "How can leadership encourage accountability for outcome in every team member, every time?" As his own trauma team members supplied answers, Arky began training emergency teams in the San Francisco Bay Area and eventually nationally. As you know, our businesses have success and failures, too. When we're successful, we've executed well. When we're failing, we haven't. Within a few years, Learning Center's work spread to the business community, its main arena since 1977. Recently, after the publication of the highly popular Execution. The Discipline Of Getting Things Done by Larry Bossidy and Ram Charan, Arky was approached by a reviewer of Built On Trust who declared the latter had "ten times more to say about execution" than Execution. 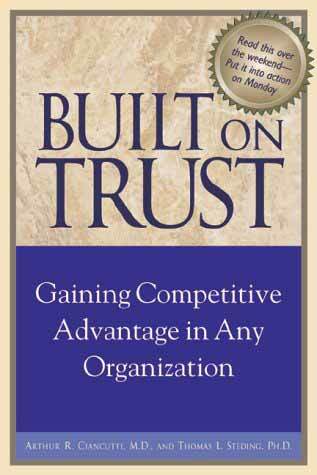 If you're looking for articles on building an effective team, read Built on Trust. Eric Schmidt, former CEO of Novell, Inc.; current CEO of Google Inc.
Paul Hawken, Founder, Smith & Hawken, and author of Growing a Business and Ecology of Commerce. Marleen McDaniel, Chairperson and CEO, Women.com. Read Ellen Pack's full frontpage Career section review. Dan Lynch, Founder, Interop, Lynch Enterprises. Michael Rothschild, President and CEO, Manager Technology Inc., and author of Bionomics. Dan Thomas, President, Focus, and author of Business Sense.